Artists Prepare for Full Moon Magic. 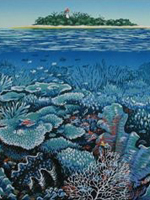 Full moon magic was at work, with coral spawning across the breadth of the Great Barrier Reef Australia. Blue 'stinger suits' over swimsuits, we were crammed into a small dinghy, which circled inside the lagoon at Low Isles, intrepid Louise at the tiller, directing operations. Darkness had given way to bright moonlight and a strange, sulphurous smell pervaded the air as we shone torches into the shallow waters. 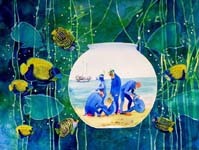 Coral eggs plopped and floated in waves to the surface, brightly coloured fish got into the act and joined the frenzied dance as some of our band jumped into the ocean and headed back to land, torches lighting the underwater activity, the trusty lighthouse their beacon. Less adventurous souls (such as me) enjoyed the excitement from a more comfortable vantage point after Louise pointed out that, once in the water, there was no getting back in the boat! The experience stayed with us and stimulated conversation well into the night as we planned our likely responses to it. Low Island at high tide - Port Douglas in the distance. 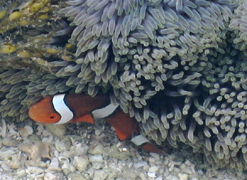 Following this initial experience, a theme developed for the exhibition, based around the notion of renewal at that time of the year in North Queensland and the understanding of the fragility of this tiny speck of an island. 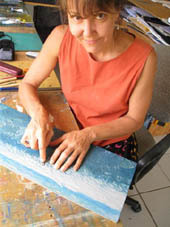 Participating artists were all members of the Low isles Protection Society and volunteered their time to care for the island from time-to-time. Here is a behind-the-scenes look at their preparation for the Low Isles inaugural Sugar Wharf exhibition, which paved the way for the development of the Go Troppo Arts Festival the following year. 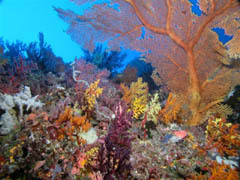 Sub-titled, 'a fragile sanctuary' the exhibition premiered at the full moon in November 2007, when coral spawning right across the breadth of the Great Barrier Reef was occurring. Truly full moon magic at work! 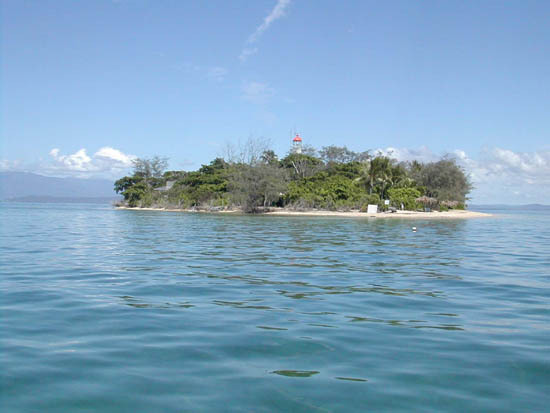 Low Isles comprises two tiny islands, an easy hour's sail from the small resort town of Port Douglas in Far North Queensland. 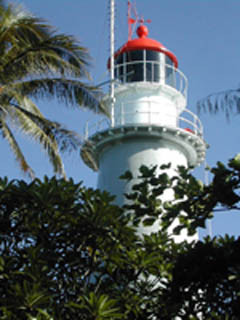 Low Island is a minute sand cay, with a tropical marine climate, housing an automated lighthouse, a University of Queensland laboratory and a permanent caretaker. So one would have expected to see lighthouse paintings, perhaps wildlife sculptures as well as references to the need to protect the Great Barrier Reef and something about the island's history as part of the select group of artists' enquiries. 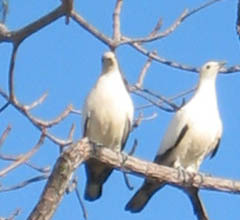 Woody Island, on the other side of the coral lagoon, is mostly mangroves and for much of the year is a closed sanctuary for the the Imperial Pied (or Torres Strait) pigeons, which migrate there in October each year. Incredibly, one of each pair of pigeons sets off each morning to feast on rainforest fruit on the mainland, returning at dusk with food for their mate and chicks. Artists' exhibition plans, although enjoyable are also a lot of hard work! Much as the pigeons are driven by instinct and the need to survive, so artists are often driven to make their art. 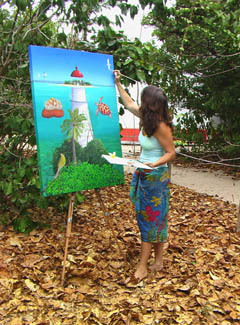 Dwarfed by the lighthouse, island caretaker, Louise Collier, works on an oil painting of the trusty beacon, whose light so often guided her home across the ocean after a day in Port Douglas. 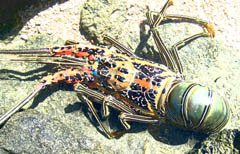 Judy Richards' whimsical comment on the Low Isles Protection Society members in their blue "stinger" suits is a light-hearted but accurate observation. 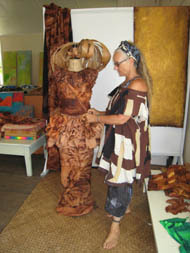 My first visit to Low Isles was with artist, Tania Heben. The huge numbers of Torres Strait or Imperial Pied pigeons and their constant, mournful 'cooing' as they nested in the bare beach almond trees or nearby Woody Island, made a lasting impression on us. 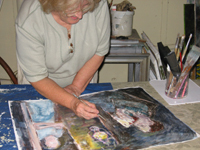 Here Tania recalls that October as she works on her sketch, 'Imperial Home'. Christine Eyres became enthralled when researching the history of Low Isles. Here she is working in her Cairns studio on the series about Ellen Hannah, whose husband and two children drifted off from the island in a tiny flat-bottomed dinghy in 1907 and were never seen again. Linda Jackson, under the guidance of the Kuku Yalanji aboriginal people, collected mangrove roots for dyeing silk. Here you see the roots in a dye-bath and the spectacular results as the dyed fabric is translated into fashion. 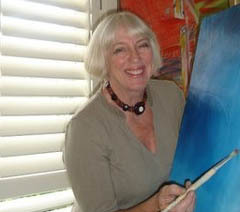 Passionate about watercolour, Gail Shaw uses the medium to great effect as seen in her painting on the left. 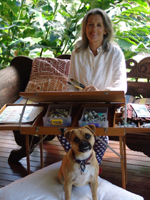 Accompanied by her small dog, Ting, she puts finishing touches to one of her entries. 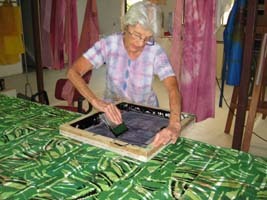 Anna Curtis works on her lino block for 'Underwater Wonderland'. For a detailed explanation of this process check out this relief printing page. 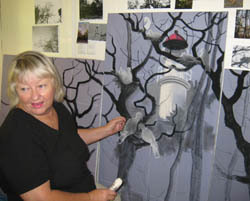 Helen Low completing her mixed media painting "The Lighthouse Keeper's Wife"
Jill Booth busily screen-printing a length of silk ready for the artists' exhibition. 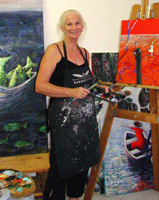 Anne Engdahl underpaints her oil painting, 'Weather Watch'. Logos of local businesses which helped to promote and fund the Low Isles exhibition. By the way, want to learn how to photograph the moon?